Developmental Dyscalculia (DD) is a specific learning disorder that is characterised by impairments in learning basic arithmetic facts, processing numerical magnitude and performing accurate and fluent calculations. These difficulties must be quantifiably below what is expected for an individual's chronological age, and must not be caused by poor educational or daily activities or by intellectual impairments. Because definitions and diagnoses of dyscalculia are in their infancy, it is difficult to suggest a prevalence, but research suggests it is around 5%. However, 'mathematical learning difficulties' are certainly not in their infancy and are very prevalent and often devastating in their impact on schooling, further and higher education and jobs. Prevalence in the UK is at least 25%. I would suggest that there is a spectrum of difficulties. Developmental Dyscalculia often occurs in association with other specific learning difficulties such as dyslexia, dyspraxia or ADHD/ADD. Co-occurrence is generally assumed to be a consequence of risk factors that are shared between disorders, for example, poor working memory. 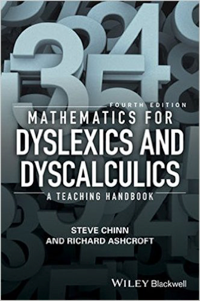 However, it should not be assumed that all dyslexics have problems with mathematics, although the percentage may be very high, or that all dyscalculics have problems with reading and writing. This may well be a much lower percentage. Quite sensibly we expect children to develop at different rates. This is especially the case for young children. Thus it is difficult to target an age where a teacher might realistically suspect a child has dyscalculia. However, the problems with mathematics start with the earliest arithmetic, for example recognizing small quantities and attaching the correct name and symbol to quantities. Progression to counting can create an illusion of learning. A child might learn to count to twenty, but in that (conceptually under-estimated) task, the child has met place value and an introduction to addition (in ones). The task of counting backwards is more challenging and too many children fail to automatise this task. It involves working memory, reversing a sequence and subtraction. In these early stages (as indeed do older learners) children need appropriate materials and visual images, linked explicitly to the symbols and concepts they represent. It should be a sophisticated matching.